Rap Attack was a possible unreleased game. 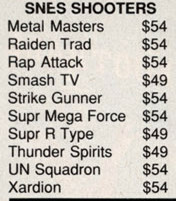 Rap Attack is a title listed in a Chips & Bits advertisement from the May 1992 issue of Gamepro. The game is listed as a shooter, and is almost certainly not related to the 1995 basketball game "Rap Jam Volume One". Listing in a May 1992 Chips & Bits advertisement. Scan courtesy of Retromags.